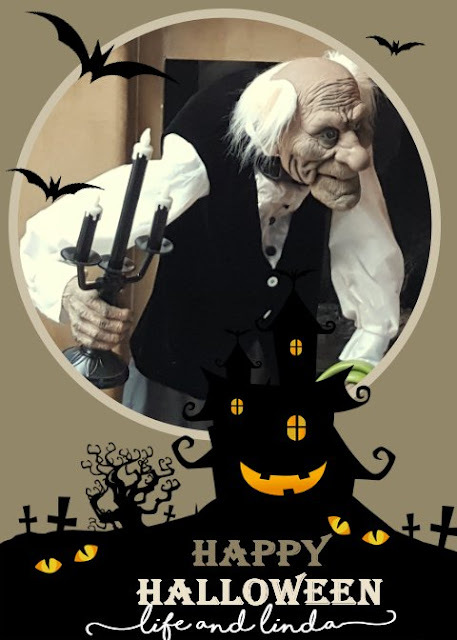 Jeeves the butler is back again for some Halloween fun! He is flanked by two tall topiaries from Grandroad. I thought it would be great fun to add my Mackenzie tote, named Miss Lola in the mix. She fits right in with the color scheme. Black and white fills the mantel this year. Mr and Mrs. Pumpkinhead join in the fun as well, along with the black velvet pumpkins. These fabulous Halloween Harper Topiaries are lovely. I kept debating if I wanted to order them. Every time, there were on sale, I would add them to my cart. There they would sit, until the sale was over. I did this for quite some time, until one day, I saw a fantastic sale I could not resist. I decided to get creative with my Mackenzie Childs ice cream bowls. 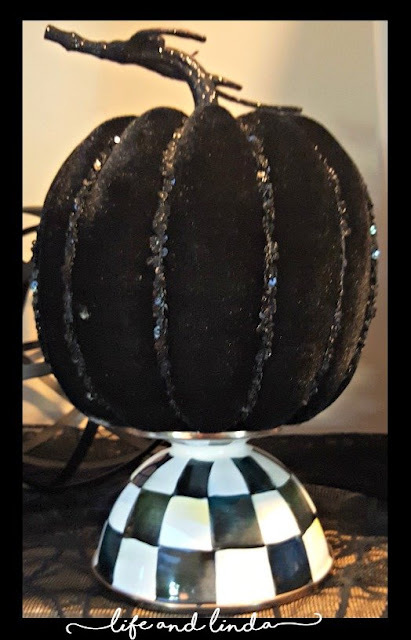 I used one as a base and turned the other upside down to create a candle base. This one I used just 1 bowl for a pedestal look. The topiaries are pictured on the Grandroad site in urns. Something to think about and add. You can find me at some of these parties. 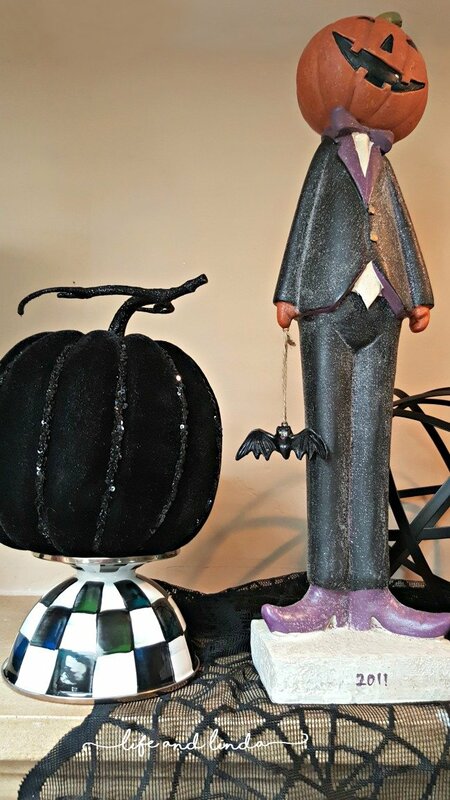 I’m joining the Hauntingly Beautiful Decor Halloween Link Party and you can too! Oh Linda, your mantel looks so awesome for Halloween. Love that butler fellow. It's always such a pleasure to see your holiday décor. I went to Pottery World this morning, but there was a landscaper using his blower all over the place, so I'll go back later. I wanted to see if they have Christmas stuff out yet? I love all the black and white you have for Halloween, it looks fabulous. Love every element here!! Clever to use the ice cream bowls (I have one and will pick up another in NYC) Love him holding your tote! and those topiaries!! They will be fabulous at Christmas, too, with big red bows!! LOVE it all!! Well done! Jeeves is a little TOO realistic! Dude would scare the poop outta me if I walked in the room in the middle of the night! 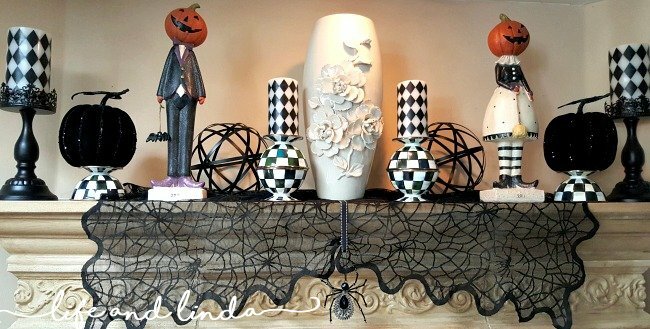 Linda, what a perfect Halloween mantel! I love you turning the MC bowls, great idea! The Grandin Road topiaries are fabulous! Linda... OMG!! Your mantel looks so festive! I positively love it! I wish I had a Jeeves around here. Have a great week and I can't wait to meet you in person! What a SPOOKTACULAR display. It is BOOTIFUL! Thanks for sharing. Jeeves looks like the perfect helper to keep around. 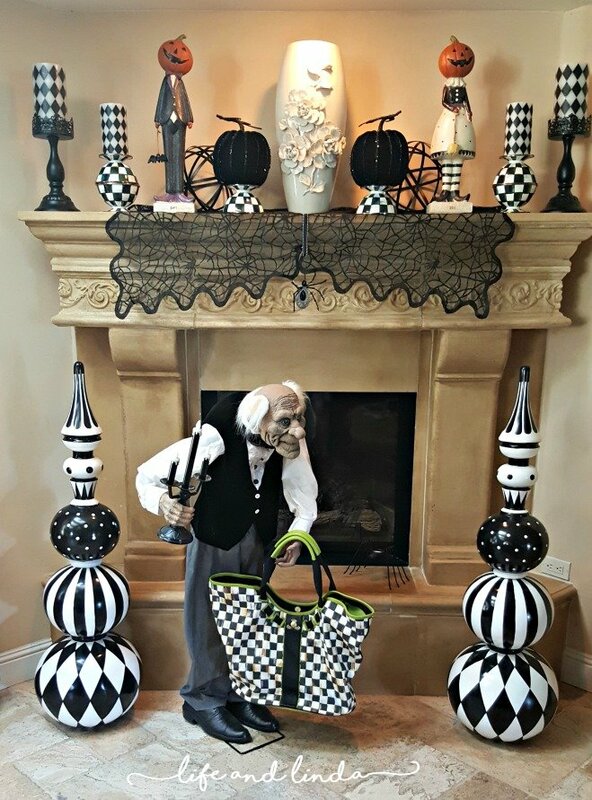 I love your black and white Halloween color scheme, Linda! It goes perfect with this holiday theme and can be both creepy and lavish at the same time! As always, you can create the most dramatic and beautiful layouts for any occasion and this one is no exception! Well done! 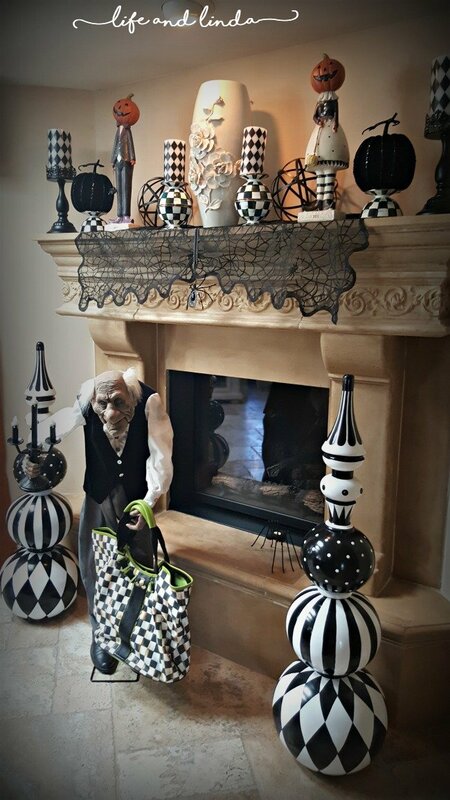 Love the black and white, love the pumpkin people and I adore Jeeves!! Oh this is just so fun! Love all the black and white, and the purse is a great touch! Thanks so much for linking up to Hauntingly Beautiful Decor Link Party! I am loving the black and white! My DIL did her whole house black and white this year and I fell in love with Grandin Road's black and white. I have Jeeves Grandfather - or maybe his son since he is quite a bit taller than Jeeves. He is my 11 year old grandsons favorite decor item. Hi Linda, my sweet friend, I love your Halloween Mantel in black and white! it really looks so wonderful! Linda, your decorations are so cute... I love black and white they're just the perfect combo! 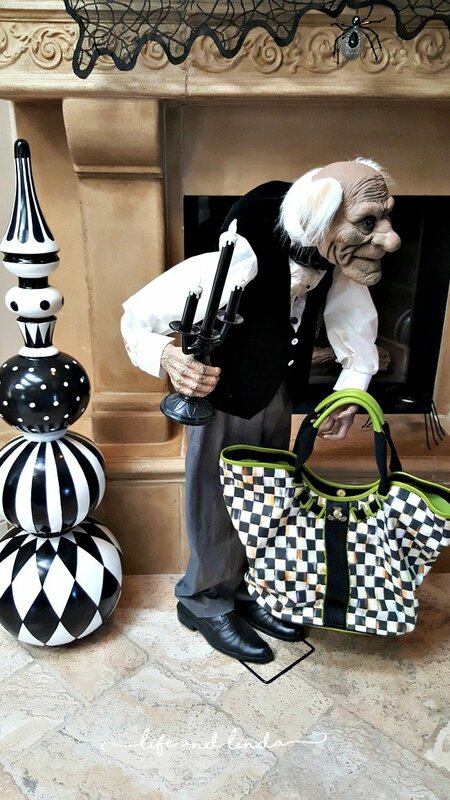 Linda, I smiled when I saw Jeeves holding the tote! Glad you got the lovely topiaries to add to your beautiful mantel decor. Very creative use of the ice cream dishes. See you soon! I love every detail of you Halloween mantle! Looks amazing! i love the pretty mantel that you decorated with the black and white Linda. Thanks for sharing at C&C with J&J. This is just super! 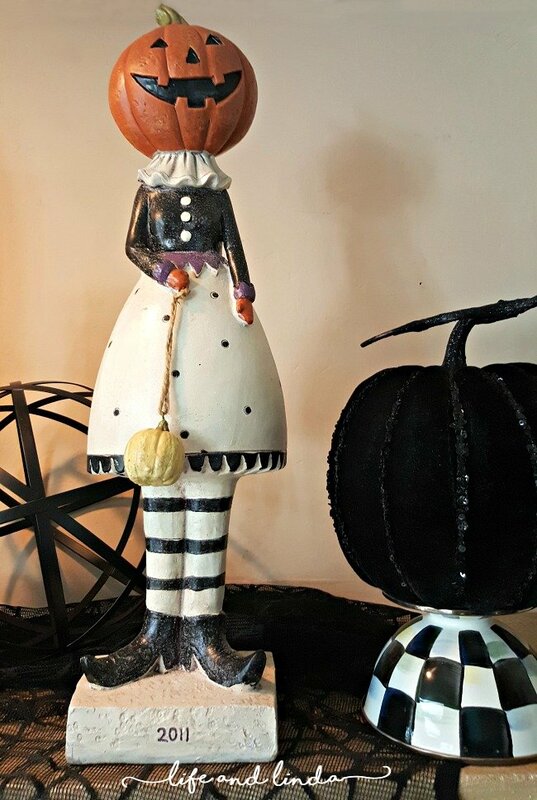 Black and white is perfect for Halloween and the orange accents just leap out at you! What a great look Linda! Those new b & w topiaries are really striking! I love Jeeves and that's cute how you added the tote bag for him to carry.